Oh JoongAng Daily, you spoil us with your twelve pages of exciting news (More than two of which are filled with advertising. This morning is no different with an exciting article titled: "Is the world ready for Korean cuisine?" An interesting question indeed, as is the report, in which we discover that lots of foreigners love Kimchi and that 49.2% of people surveyed said that their number one reason to visit Korea was to "taste Korean food". 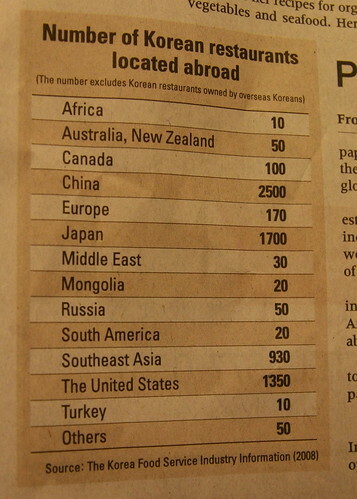 "Number of Korean restaurants located abroad (The number excludes Korean restaurants owned by overseas Koreans)"
What? If overseas Koreans don't own these restaurants then who does? Domestic Koreans? Non-Koreans? Who owns these 6,990 restaurants? The Korea Food Service Information board has done a cracking job in making this table clear and useful for all who chance to read it! So how many Korean restaurants owned by overseas Koreans are there? Will we ever know? On a brighter note, Andrew Salmon wrote a much better article titled "Globalize Korean Cuisine not Korean Food Exports" for the Chosun Ilbo a couple of weeks ago.